This is an ongoing series about saving during different stages of life. You can read the previous editions about saving in your 30s and in your 40s. When you’re in your 50s, you’re nearing the end of your working life, and preparing for retirement. Perhaps you’ve maximized your retirement savings and branched out to build a robust emergency savings. Maybe your investment savings includes a diverse variety of investment options which give you a strong variety of properties and assets your family can inherit and cherish for years to come. At this point, you might think you have everything figured out. However, you might want to consider moving your assets to include more advanced investment options. This not only continues to build your wealth, but prepares you for retirement and living on a fixed income. Saving in your 50s doesn’t have to be complicated, and you have many options available to ensure you’re able to save enough to enjoy retirement. Let’s take a look at how you can make the most of different investment strategies in your 50s, and then we’ll review what you can do to prepare to live off your savings. What if My Retirement Savings Isn’t on Track? According to statistics from Consumer Finances, 67% of families headed by a worker aged 55-65 had less than $88,000 in retirement savings. That amount isn’t going to provide a comfortable retirement for most people. Over the course of 10 years, that would leave you with roughly $733 to live on per month! If you’re turning 50 and are concerned about your retirement savings, you should reevaluate your portfolio and make up for lost time. Consolidate your accounts – Have you rolled over your retirement accounts from past employers? If not, you could be missing out on the full value of your accounts. Organize your transfers with the help of a portfolio manager to avoid receiving the funds out-right, and the IRS believing you took an early withdrawal. Put more in savings – Putting a higher percentage of your paycheck into retirement funds will help you catch up on your savings. If you haven’t been putting away at least 10% of your paycheck, it’s time to put that much away and more in order to get back on track. Some advisors recommend putting aside as much as 20% of your income, according to an article from U.S. Money. Max out your IRA – In your younger years, contributions to your Roth IRA were limited to $5,000 per year. 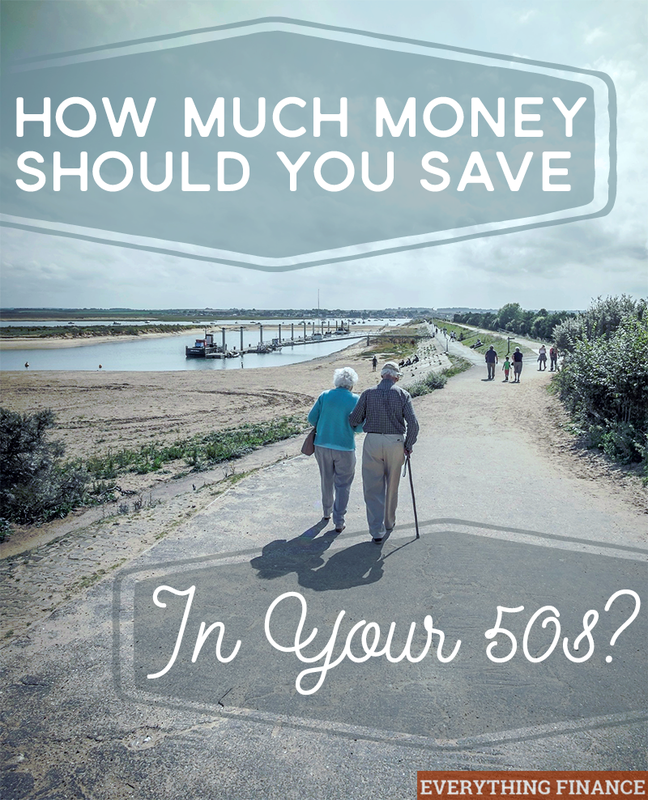 However, once you turn 50, the limit rises to $6,000 per year. If you’re not meeting this new limit, do so now to catch up on your retirement savings and have enough put away to live comfortably in your golden years. Rebalance your portfolio – Now isn’t the time to take big risks with your large and diversified portfolio. If your investment strategy has been aggressive, your portfolio needs to be rebalanced towards a more conservative strategy in order to minimize risk. Since retirement isn’t far off, it’s better to invest with fewer risks rather than make hasty choices which could backfire. Downsize your lifestyle – Is your house paid for but expensive to maintain? Do you have a number of assets you no longer find valuable, such as a boat or rental property? It might be time to make major changes, such as selling your home for a smaller, more manageable space, or selling assets which are no longer useful to you. Put the money you save towards your retirement. Making these major changes now might feel painful, but they will help in the long run as you begin to transition to living on a fixed income (which is typical of retirement). If you’ve been following the common investment rules for setting enough aside for retirement, and you still want other ideas on how to invest your money, here are some tips to get you started on some of the most advanced investing options left to you. Usually defined as an unsecured personal loan given to a non-relative, peer to peer lending is a great way to expand your portfolio while helping others. If you feel like lending money to individuals that prefer not to go through traditional financial institutions, peer to peer lending might be for you. Peer to peer lending isn’t for everyone, however. You might have experience lending to businesses, but not directly to people, so it might feel different despite the stringent requirements most institutions have for the borrowers of these loans. For example, Lending Club requires borrowers to have a credit score over 700, a long credit history, and low debt-to-income ratio. Any type of lending requires risk, and while you do receive interest on payments, borrowers defaulting is still a risk you must consider when researching peer-to-peer lending as part of your investment strategy. Often seen as a negative type of investment, a hedge fund includes a number of investors who pool their capital in securities and other types of investments. Structured as a limited partnership, limited liability company (LLC), or similar vehicle, hedge funds differ from mutual funds as they don’t have a cap for the amount of money that’s invested. This advanced investment tool is managed by a hedge fund manager or a larger firm. If you’re interested in hedge funds, be prepared to invest a large amount of money. According to a Forbes article on Hedge Funds 101, the typical minimum hedge fund investment is between $500,000 and $1 million. Larger firms may require a higher minimum amount invested. Finally, commodities are an option for investors who want their money put towards real goods, such as raw materials like oil, natural gas, timber, gold, and platinum. Commodities are used to create other goods or are goods themselves. When you invest in commodities, you can trade in futures contracts or exchange traded products (ETPs) that directly track a specific commodity index. Relying on an ETP can give you a way to invest in a portfolio of commodities without relying heavily on just one commodity. However, there are some risks that come with commodity investing, as commodities are extremely volatile and can be tricky to predict because of foreign markets. According to Fidelity’s learning center, emerging markets can also impact the performance of commodities returns. We don’t know when or if a foreign government or economy will impact investments, so tread lightly if you expand into commodities. If you’re comfortable with your retirement plan and how to invest your money without being too risky, it’s time to start planning as your 60s draw closer. The writers at About Money offer some of the following tips for preparing for retiring in the near future. Regardless if you’ve worked closely with a financial advisor or are self-educated about your investments, it’s important to run the numbers to make sure you’re on track. There are various retirement calculators available online for you to use to get a general idea of where your retirement savings is versus how to improve it. If the projections worry you, or you want a more accurate picture, working with a retirement planner is a good route to go. A retirement planner has special experience working with people in the same situation who want a better idea of what their finances look like. They can give you peace of mind about what’s happening with your money. If you feel like your spending is out of control, or you haven’t re-evaluated your budget lately, it’s time to think about your long-term plan for living within your means. In retirement, there will be fewer opportunities to earn money on the fly like when you were employed; you’ll be living off a fixed income, so you need a fixed spending plan to reflect that. Healthcare costs are also a consideration during this time period, so make sure you have a healthy amount saved for any emergencies or can rely on a health savings account to spend on your needs. As you age, you may need more funds for healthcare than in your earlier life, so plan accordingly. Perhaps you’re the kind of person who always needs to have a project going, or you’re worried your retirement savings won’t be enough. If either of these are the case, consider building a strategy now to make money after you’ve hung up your hat. Do you have extensive experience in a field to the point where you can offer consulting services? Do you have any hobbies that can generate income? This might be difficult to consider as you plan your future, but it’s better to be rooted in reality than to encounter the shock of not having enough to retire later. Make connections in your industry or in an industry that interests you. This can help you in the future. You might also consider getting a part time job that keeps you sharp and allows you to socialize with people. This is something many people in retirement don’t consider until after the decision to retire has long passed. Having a flexible role may give you an opportunity to remain creative, mentor younger workers, and give yourself a little income along the way. Retirement might be a scary time, but it’s also a fun new beginning! The fact that you’re working towards financial goals for your future is a testament to your preparation so far. Keep an eye on your budget, your savings, and your investments in order to have a stable future for yourself and your loved ones.